Our 5- frame nucleus colonies have laying queens that have been laying for 4 weeks or better, and are ready to transfer into hive bodies, sometimes referred to as ‘deeps‘. Each hive comes with 5 frames of bees & brood. Come with your own deep brood boxes with five frames of your own. We are selling you five frames with bees, brood and queen to fill out the box. We do not sell equipment. We raise our own queens from survivor stock and all are field bred, they are Northern Survivor Hybrids from the various strains we use to breed traits into our bees. The bees are picked up at our place in the evening(so they are in from their day flight) where you can transfer your own or we will them transfer for you. This way you have the opportunity to check your queen’s laying pattern before you take them. Queens can be difficult to find. It is the laying pattern that tells you how productive she is. Once the transfer is made they will ride fine after dark in a pick-up truck. (Not in the vehicle with you- ouch! ) We will call you with a pick-up time and date. Please make sure we have your phone number. Make sure you staple your hive body to your bottom board before getting here, and don’t forget, you will need your veil, beekeeping suit, gloves, smoker, hive tool, etc. All colonies are inspected and treated for Varroa and Tracheal and Nosema before you pick them up. Pay $40 deposit on each nuc you want to order; choose your time frame: Remember we will call you to set up an exact date and time. Please be as on as time as possible. The bees get nasty after dark! Pay the balance in cash when you pick up the bees. We prefer cash and do not take out-of-state checks. 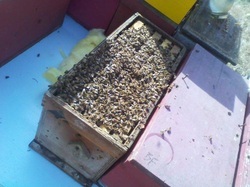 A ‘READY-TO-GO’ FIVE- FRAME WAX NUC BOX WITH QUEEN INSTALLED IN QUEEN CAGE! New this year - Ready-To-Go 5 frame NUC! READY-TO-GO! YOU PICK UP AND KEEP! SAVES TIME AND YOU GET TO SEE YOUR QUEEN IN A SPECIAL CAGE! ORDER NOW AS THESE ARE FOR A LIMITED TIME ONLY! IF YOU HAVE ALREADY ORDERED (LESS THAN 4) CALL OUR OFFICE TO TALK ABOUT HOW TO UPGRADE! Nucleus Colony DEPOSIT ONLY - Please pay in cash when you pick up. Any questions call: (802) 948-2057. Orwell is one hour south of Burlington coming south on 22A. As you get to Orwell township area, you will see a yellow blinking traffic light (a Gulf gas station on right), continue south through the intersection for about 0.6 mile to COOK RD — which is a RIGHT-hand turn onto a dirt road. Follow Cook Rd until you come to a 'Y'. Bear left onto STAGE RD. Go 1.7 miles to SINGING CEDARS RD. (There may only be a hand-made sign as the town seems to have given up on our road sign). Once on Singing Cedars Rd, we are the 5th house on the right going down a big hill. You will see our WHITE MAILBOX WITH BEE on it. Number #77. It's about 3.6 miles from the yellow light to our house. Continue on North Crossroads to the 4-corner stop sign. Take a right onto STAGE ROAD and continue for about 0.6 miles to SINGING CEDARS ROAD. (HOME-MADE ROAD SIGN). We are the 5th house on the right coming down a big hill. You will see our WHITE MAILBOX WITH A BEE ON IT - #77. (Total of 4.4 miles from Gulf station to our house). COMPLETE DIRECTIONS AND WHAT TO BRING.